(Mozart, Kubelík, Bruch, Vieuxtemps, Saint-Saens, Wieniawski, Paganini, Sarasate) Jan Kubelík - violin, Alfréd Holeèek, Rafael Kubelík - piano. Text: Cz/Engl; recorded 1912-1935. TT: 70:39, AAD. Published by the Jan Kubelík Society, 2000. My first encounter with Jan Kubelík dates back to my childhood days when my teacher lent me Kubelík's biography and played me his recordings on old 78s. I came across him again many years later when I discovered a double-volume complete set of Kubelík's recordings from the years 1902 to 1913 (Biddulph Recordings LAB 033-34) at a market in Geneva in 1991. In subsequent years, I would come across recordings of his from time to time and, at the beginning of this year, I was asked to review a record published by the Society which bears the name of this legendary violinist. This is unquestionably one of the most active music societies, thanks to which the Kubelík legacy has been kept alive in Czech consciousness. The issue of these recordings (apparently hitherto unpublished) from the years 1912-1935, suitably following on from the above-mentioned title, is the culmination of the Society's activities to date. The work is valuable mainly for collectors and admirers of Kubelík's art. The live recording of Kubelík's concert held in Carnegie Hall, New York, on March 31, 1935 is indeed a rarity. 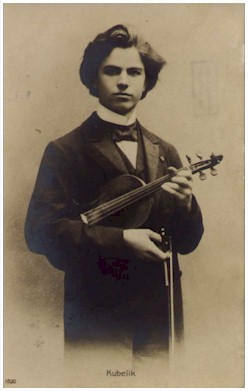 Paganini's Campanella is proof of the fact that, even in his later years, Kubelík was endowed with a truly masterful technique (here accompanied by his son Rafael Kubelík). The music reflecting the phenomenal abilities and dazzling international career of violinist Jan Kubelík (1880-1940) has finally been captured on a CD in the Czech Republic. The first re-edition on the LP came out on the Melodiya label (45295), and an LP was also published for Czech listeners by Supraphon (10113193) - both came out in 1983. The first CD was issued in 1991 by the British company Symposium (1072), and the second is published now, under the guidance of the Jan Kubelík Society (without edit. no. ; reg. no. GZ LC 2028). The brilliant violin technique, the crystal-clear intonation, the natural virtuosity and light, translucent tones, and everything else in which Jan Kubelík was unsurpassed, can now be heard in over forty original recordings. 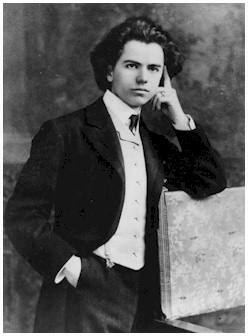 Some works were re-recorded more than once (three versions of Kubelík's own Canzonetta and Fantasia on a Theme from Lucia di Lammermoor); however, always producing different results. While Melodiya left the original sound without correction, Supraphon opted for drastic filters and Symposium had at its disposal top quality compact technology with great experience in re-recording techniques. The Jan Kubelík Society has surpassed all its predecessors, however, with a presentation of the most valuable (Mozart, Bruch, Vieuxtemps), alternative (Wieniawski, Kubelík, Paganini) and simply unique recordings (from Prague 1934 and New York 1935). With a fascinating repertoire and brilliant performances, the Jan Kubelík Society is offering an outstanding CD, deserving the wide international publicity.